Over the past three months I’ve project managed a refresh of the Learning and Performance Institute’s Capability Map for Learning and Development professionals… Yeah, the full title is a mouthful. It abbreviates to ‘LPI L&D Capability Map.’ I’ve been narrating my work on this project on Snapchat (where you can find me as @michelleockers6). I’ve downloaded my daily Snapchat videos and intend to create a single video narrating the refresh process from my experience as the Project Manager. For today’s daily dispatch I won’t give a lot of background to the project as it would turn this into a lengthy post. The brief version …. 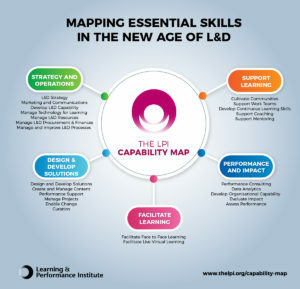 In 2012 the LPI development a Capability Map to define the skills required in a L&D department. They published it on their website and made it freely available for people to self-assess. In the six years since it was published there have been a lot of shifts impacting the role and skillset of L&D. Recognising this, the LPI decided to refresh the Capability Map. Open survey to gather feedback on skills described in the 2012 Capability Map. Survey was sent to approximately 3,000 people who had self-assessed using the Capability Map. It was also posted on LinkedIn with an open invitation for anyone interested to provide feedback. Steering Group consisting of 22 leading L&D practitioners who reviewed feedback, provided guidance on changes required to the set of skills and shifts that needed to be reflected in skill descriptions. The Steering Group also endorsed the updated Capability Map. Working Groups consisting of approximately 50 people (including some Steering Group members) who drafted new or updated descriptions of skills within their area of expertise. This was an intensive activity with Working Group members collaborating across countries and time zones to complete skill descriptions in two to three weeks. Continuing the approach, when the LPI L&D Capability Map is launched in October 2018 a four month ‘Consultation Period’ will occur where people using the refreshed Capability Map will be invited to provide feedback on usability. This feedback will be used to refine (or ‘tweak’) the Capability Map. All Steering Group and Working Group members are volunteers who recognised the value of the Capability Map to the L&D profession and were willing to contribute to the project. It’s been an absolute pleasure to engage with so many people and to be privy to many good discussions about the skills needed now and into the next two-three years in the profession. In the past week I’ve drafted a capability framework for Learning and Development practitioners in a large corporate. This is a forward-looking framework that will be implemented as part of an organisation-wide transformation of learning. One of the new activities that the L&D team will undertake is curation. Coincidentally, this weeks #LDInsight Twitter chat topic was curation. When I shared a resource on curation that I had used as input to define capability framework for content curation it was spotted by Niall Gavin who had attended the Twitter chat. He expressed an interest in the capability framework, and I promised to post my draft. Full draft is shown below, and is also available in pdf. I’m aware of two large corporates in Australia who have roles dedicated to content curation in their Learning and Development teams, and others that use curation as part of solution development. The value of curation for organisational learning is well-established, although it is less common to have dedicated curator roles in organisations. Where the organisation is large enough and the value of reusing existing internal and external content is high there can be a case for dedicated curators, even if for a set period of time only as an initiative to establish collections of curated content against strategic capabilities. Where have you seen content curation used in organisations? What are your thoughts on the capability framework posted above, and have you seen other definitions of curation as part of a capability framework/model?